St. John 2018 Future City Team Presents in China! Members of the St. John Lutheran School Future City 2018 National Runner-Up Team traveled to China November 17 to 25 to present to the Chinese Engineering Society (CES). The St. John 2018 team’s presenters, Reagan Rutkowski, Sloane Kerska and Ethan Dodson as well as the team’s alternate, Prisca Yim, provided a presentation of the team’s 2017-2018 National Runner-Up model and met with Future City student teams from throughout China. Traveling with the team was the team’s Engineer Educator, Dr. Linda Gerhardt of General Motors, the teams’ Engineer Mentor, Bill Abramczyk of FCA, the teacher mentor, 8th grade Teacher Tim Grothaus as well as student parents. We are thankful to God for a safe and successful trip! Wins 2018 Regional Championship ! 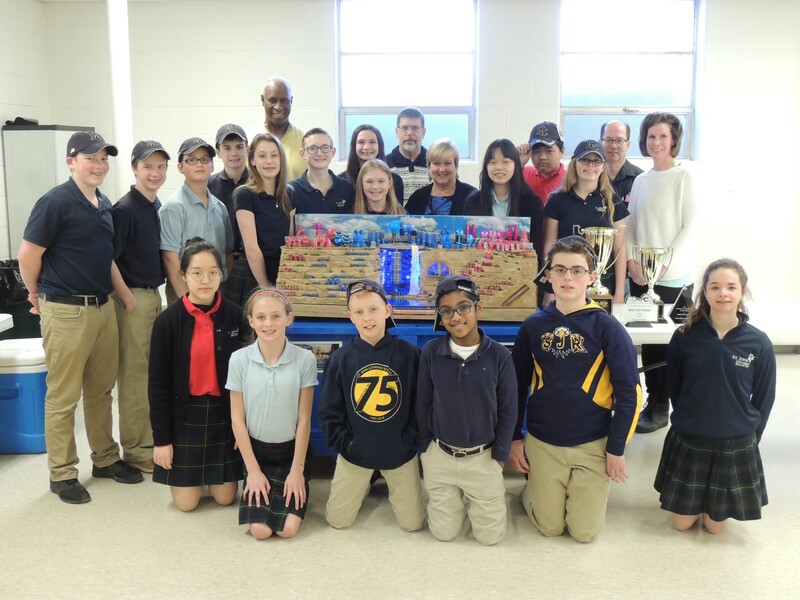 The Future City competition team from St. John Lutheran School in Rochester, Michigan earned 2nd Place at the National Future City Competition, February 17-20, in Washington, D.C. The team also earned "Best Essay". 1st place in the 2018 Michigan Regional Future City competition on Monday, January 21. The Engineering Society of Detroit is the sponsor of the Regional round of the competition, which was held at the Suburban Showcase Collection in Novi, Michigan. The St. John team also received "Best City for People with Disabilities", sponsored by the Michigan Paralyzed Veterans of America and "People's Choice Award", sponsored by the Ford Motor Company. The team will compete at Nationals in Washington, D.C. February 17 - 20. St. John has won the Michigan Regional Championship 12 times, finished in the "Top 10 National" 8 times, and participated in the "Top 5 National" 6 times, including winning back-to-back championships in 2014 and 2015, the first school ever to achieve this. 2018 is St. John Lutheran School’s 21st year of participating in the Future City program. Most years were under the leadership of former St. John teacher Mr. Jon Pfund, together with a number of engineer mentors. Dr. Linda Gerhardt, Global Paint Quality Lead at General Motors, is in her 10th year with the team, this year as Educator Engineer and previously as Engineer Mentor. William (Bill) Abramczyk of FCA, a former Engineer Mentor and team-member parent, returned this year as Engineer Mentor. Mr. Tim Grothaus is this year's Teacher Sponsor. The team’s student presenters were Ethan Dodson, Sloane Kerska and Reagan Rutkowski, with alternate Prisca Yim. This year’s theme was The Age-Friendly City, asking participants to identify an age-related challenge that exists in today's urban environments and allows the city's senior citizens to be as active and independent as they want to be. Future City Competition (futurecity.org) is a national, project-based learning experience where students in 6th, 7th, and 8th grade imagine, design and build cities set at least 150 years in the future. Students work as a team with an educator and engineer mentor to plan cities using SimCity™ software, research and write solutions to an engineering problem, build tabletop scale models with recycled materials, and present their ideas before judges at Regional Competitions in January. Regional winners represent their region at the National Finals during National Engineers Week in Washington, DC in February. Future City is offered at St. John Lutheran School as an Academic Enrichment course in Middle School. 5th grade students may attend the after school and weekend meetings as apprentices. St. John Lutheran School | Future City Team in the News! CLICK HERE to watch the team's presentation at Nationals. To read about Future City on ESD Tech Century, CLICK HERE. For an article from the Oakland Press, CLICK HERE.